Additional authors: Lichtenheld, Tom, -- illustrator. Published by : Houghton Mifflin Harcourt (Boston :) Physical details: 39 unnumbered pages : olor illustrations ; | 24 cm. ISBN:9780544032569; 054403256X. Subject(s): Best friends -- Juvenile fiction. | Friendship -- Juvenile fiction. | Staffs (Sticks, canes, etc.) -- Juvenile fiction. | Stone -- Juvenile fiction. | Stories in rhyme -- Juvenile fiction. | Stories in rhyme -- Juvenile fiction. 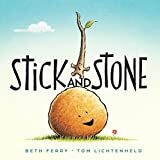 Stick and Stone are both lonely until Pinecone's teasing causes one to stick up for the other, and a solid friendship is formed.